Buy this item and earn 3,825 points valued at £38.25. Description:Available wood colors: Cherry, Walnut, Mahogany. Nr. 4 removable/adjustable shelves. (cm: 45W x 27D x 2H). Alarm: red L.E.D. signals at low water level. 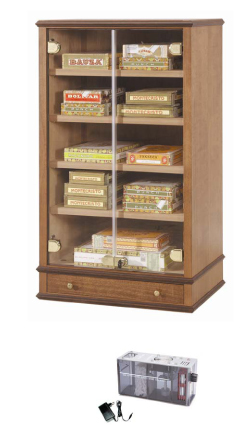 Optional:· Extra shelf for loose cigars.